One of the most interesting natural features of the island of the Bahamas are the massive underwater cave or sinkholes known as Blue Holes. These blue holes are found in many tropical regions throughout the world, but the Bahamas is home to some of the most fascinating and jaw-dropping of these blue holes. If you are coming to Nassau and have your scuba diving certification, do not miss your chance to dive at one of these truly mesmerizing blue holes! The Lost Blue Hole dive takes a small number of certified divers out to one of these famous blue holes. The “Lost Blue Hole” is a remote and beautiful blue hole that has a good amount of marine life to keep scuba divers interested. But what is most fascinating about this blue hole is its sheer depth! The perimeter of the Lost Blue Hole starts at about 40 feet of depth, but once you reach the perimeter and you look down, you are looking down to a cave that is over 200 feet deep! The depth and cavernous nature of the blue hole gives it its signature dark blue color. Divers joining us for this dive will have the chance to go into the blue hole and explore it up to depths of about 90 feet. 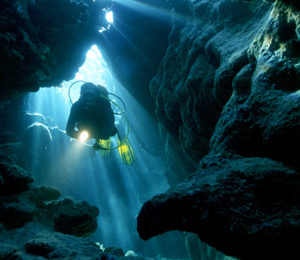 The blue holes of the Bahamas are like a wonder of nature. They are truly impressive to see above the surface of the water, and they feel like a completely different planet when you are actually diving in them. At the Lost Blue Hole, you can expect to see some marine residents including a giant southern stingrays, large grouper, reef sharks, turtles, pelagic fish species, and all types reef, sponge, and coral. The dive at the Lost Blue Hole is followed by a dive at one of the best coral reef sites in the Bahamas. Here you will find a whole new array of colorful reef fish and other marine species. I have been to the Bahamas many times, but The Lost Blue Hole & Reef Dive is one of my favorite trips! It includes everything that everyone should do here. As a Bahamas veteran, I can say only the best about this experience!